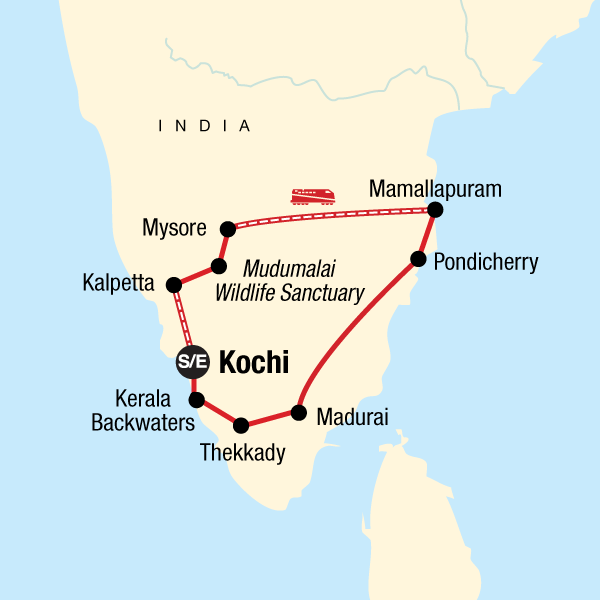 This two week tour of southern India place travellers into a small group of like-minded cultural adventurers as they embark on a round-trip from the backwaters of Kochi and venture forth as far as Chennai, overlooking the Bay of Bengal on India’s southeast coast. As you travel overland, by train, rickshaw and private bus, you’ll get to witness landscapes morphing in one seamless scene change after the next. Photographers take note: wildlife watching in the sanctuaries of Wayanad and Mudumalai ensures your camera never stops clicking, all the way back to the canals of Alleppey. Spice plantations, tiger safaris and homestays in Kerala all add up to an incredibly varied tour of southern India with opportunities to learn, discover and have fun with newfound friends certain to stay long in the memory even after the tan has finally faded. Low Impact Transportation: India has lots of options for getting around making less of an impact. We always try to use transport that creates fewer emissions. We will take the train, cycle-rickshaw, auto-rickshaw, and canoe!. The train can certainly be counted as one of the marvels of modern India, and no visit is complete without at least one train trip. We take a hundred year old steam train from Coonoor to Ooty where you can enjoy the breath taking views of the Nilgiri mountains. Mamallapuram is a small town with all the interesting spots like monuments, cave temples, stone workshops, seafood restaurants, and beautiful beach. So the bicycle ride in the town is one of the highlights of the tour. Riding one of the ubiquitous cycle-rickshaws is another experience in itself, not to mention taking local buses – always an adventure. Getting around as the locals do not only allows you to experience the culture on a deeper level, but the same way it is at home, using public transport is the most sustainable way to go – after walking and cycling of course! Wildlife Sanctuaries: Mudumalai or "Ancient Hill Range" is situated at the base of the Nilgiri Hills. The sanctuary provides one of the most important refuges for the elephant and bison in India. The park encompasses some 320 sq kms of undulating terrain and varrying vegetation. There is a rich diversity of wildlife within the sanctaury including Nilgiri tahr, sambar, tiger, spotted deer, and flying squirrel. And more than 120 species of birds, including heron, stork, egret, kite, falcon, peafowl, woodpecker, drongo and the warbler will keep the keen bird watchers happy. We spend part of the afternoon on a short safari spotting the variety of wildlife within the park. We also visit one of the few habitats remaining for wild tigers in India (and indeed, the world), Periyar, also known as Thekkady. It is nestled in the high ranges of Western Ghats in Kerala, part of Project Tiger, a wildlife conservation project designed to protect Royal Bengal Tigers from extinction. Set high in the mountains of the Western Ghats, about 100kms from the Backwaters, this protected area covers 777 sq kms, out of which a 350 sq km part of the core zone was made into the Periyar National Park and Tiger Reserve. Famous for its picturesque lake and of course tiger (which number about 40), the park is also home to 62 different kinds of mammal. National parks and private reserves protect the world’s last remaining large tracts of natural forest, wildlife refuge and the planet’s biodiversity. Visiting national parks is an important way to contribute to conservation because entrance fees are the core method of funding many parks, from maintenance to security and protection from poaching. Visitors help the parks to pay staff and keep the park protected. Support World Heritage: On this trip there are numerous opportunities to visit important heritage sites on foot or by bicycle such as 7th century Shore Temple, and the famous temple cities of Thanjavur and Tiruchirapalli, among others. Celebrating world heritage is an important way to participate in sustainable tourism. World heritage sites are designated for protection so that all the world’s people can share in these fascinating and historical wonders for generations to come. Appreciating Local Culture: India is a country that is very different to anything you will have experienced before. Although this means it is not the easiest place to travel, this is also what makes it so special. Pollution, poverty and the crowds can result in initial culture shock but should be seen as an exciting new challenge. During our time here we have come to love this large and wonderfully different country but we know that we should always expect to encounter some difficulties along the way. In India there are very different attitudes to time keeping, public cleanliness, privacy and service. Trains will sometimes be late, plumbing can sometimes be temperamental and power will often just vanish. Optimistic menus turn out to have only one dish available and everyone, just everyone, will want to know your name. If you are able to travel with a lot of patience and a healthy sense of humour, then we know that you - like us - will be captivated by what India has to offer. Supporting Local Businesses: There are a multitude of opportunities to support local businesses on this trip. From the colourful markets to the bustling food stalls and cafes amid craft bazaars, the choices for eating and handicrafts are endless and the money is staying in the local economy - a vital way for tourism to make a positive impact. Activities that take you to markets, locally-owned restaurants, and villages are vital to the local peoples’ ability to truly benefit from tourism. Our style of trip, travelling and eating with the locals, puts you right at the heart of Indian culture. Vegetarian? You’ve found the right place, India is a haven for vegetarian food, and a delicious way to tread lightly on the planet. Be sure to try one of Madurai’s popular sweet carumbu (sugarcane juice) drinks. Homestay with a local family: Homestays are one of the best ways for tourism to benefit local people. Your overnight visit to their home supplements income which is often much needed in rural areas in countries like India. Accommodation here is on a multi-share basis and all the families live within a few hundred meters of each other, with at least one person in the family speaking some English. Food is traditional Keralan home cooking and is superb. We explore the island with a local person on foot and by canoe to observe the different facets of village life - a great chance to meet and talk with the people who live here. Strolling under the palm trees, we weave in between the rice fields that cover the island and learn more about the lifestyles of the locals. Just before sunset we jump on a small country boat and journey along with the locals to enjoy sunset on the winding backwaters. Being blessed by an elephant in Pondicherry, and our dusk canoe trip on the Kerala backwaters. Don't be afraid to go off exploring on your own. Don't get obsessed about photographing everything - take time to actually look at and experience both the people and the amazing sights. We have travelled quite extensively (including a previous trip to north India) but this was the first organised group holiday we have been on. We really enjoyed it. The guide (Muthu) was fantastic, and the other people on the tour were an interesting and eclectic mix, some of whom we will definitely be keeping in touch with. There was perhaps a bit more travelling than would have been ideal but that is not meant to be in any way a criticism - less travelling would have meant less fascinating and varied places to see. Overall an extremely well organised tour which we wouldn't hesitate to recommend to others. The whole holiday was fabulous but I loved the homestay in Kerala the best! Pack light as there is lots of travelling and be prepared for some long days on the road well worth it. Yes. The company used locally owned hotels and transport. Good overview of this part of India.